GridCast: live and behind the scenes of grid computing: One, Two, Three... Run!! 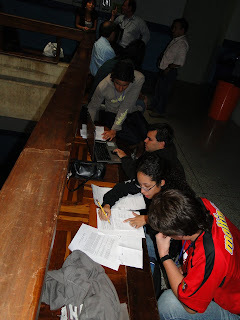 Parallel Programming Marathon starts with 4 teams of Colombia and Venezuela Universities. The activity search to motivate undergraduate students to "think in parallel". 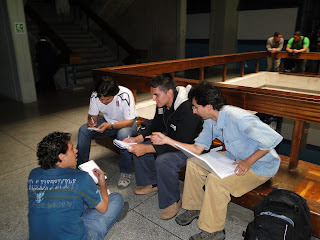 Proposed by Nicolas Maillard, UFRGS-Brasil Professor with the assistance of Robinson Rivas, UCV-Venezuela professor, the CLCAR Parallel Programming Marathon is a "fair play" activity. The teams will have to parallelize a set of problems in a limited time; the better the accelerations, more points to the programmers. Who will reach true High-Performance Computing?